Eli Brueggemann lives his life on the edge. Now in his third season as musical director and composer for Saturday Night Live, the California-bred musician no doubt has one of the wildest jobs in all of the music industry. 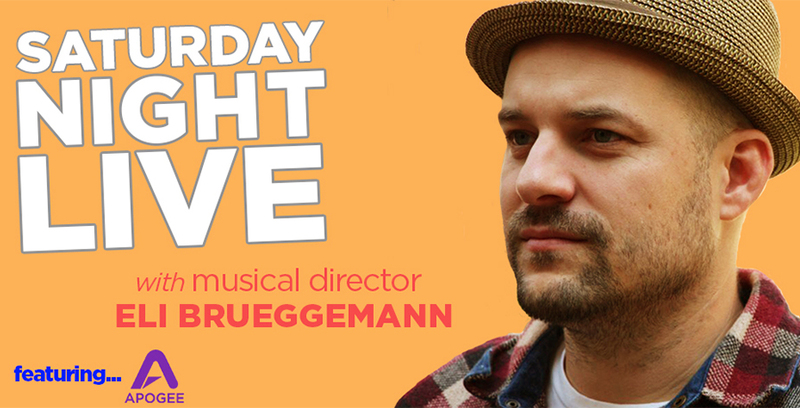 He’s the guy responsible for writing and producing all of the hilarious, eclectic sounds and songs you hear on SNL week after week. That’s right, he does it all – which usually means creating dozens of original tunes and snippets just in time to reach the millions of people watching and listening live every Saturday night. And if his success while working under hellish deadlines at all times doesn’t quite convince you of the man’s super powers, surely the quality of his productions will. But what’s a good superhero without his trusty sidekick? That’s where Apogee comes into play. We were lucky enough to speak with Eli about the insane demands and routines of recording the show’s many musical bits, from jingles to digital shorts and just about everything in between. A longtime Apogee user, Eli leans on products like Duet and MiC every day to capture pristine recordings of the SNL band and cast members while working on the fly. Here’s what the director/producer/keyboardist had to say about recording with Apogee in the ever-thrilling SNL workplace. How would you describe the music you record for SNL? We do a little bit of everything, from in the box productions to live recordings of the band. I’ve composed pop, funk, Latin, traditional jazz, EDM, dubstep, Broadway, cabaret, jingles… and more. All in the service of helping the joke along for the brilliant writers at SNL. What is your current setup for recording original music, jingles, and spoofs? How would you describe the recording process each week? Where do you record? We have offices on the 17th floor of 30 Rock, where the writers make 40 or so sketches for a Wednesday read through. From our standpoint, we try to provide the writers with as fully produced a musical/sound effects demo as possible for the table read. Me, Lenny Pickett and Leon Pendarvis work on Mac 12 cores with oodles of samples and patches. I use the Apogee Duet interface, a UA 710 preamp and a bunch of different mics for vocal overdubs. Once we know what sketches get picked, we go into full production, at which time we have access to more bells and whistles downstairs on the 8th floor studio level. But I’d say 80% of what ends up on TV gets done on my upstairs rig. Do you use Apogee products to record the music for digital shorts? We can’t get enough of those! Yes. All the time. Especially for stuff where the idea is crystalized enough for the table read. If I get agood take out of Jay Pharoah or whoever on Tuesday night, I’ll keep it and produce the rest of the track upstairs on my setup. We have a very musical cast this year, and they are literally all great. Great past hosts I’ve worked with include Kerry Washington, Martin Short, Steve Martin, Kristen Wiig, Jimmy Fallon, and obviously Justin Timberlake. What’s important to you when choosing gear to record audio for SNL? Consistency and Clarity. I don’t have time to deal with bumps in the road. Everything is done from Tuesday night to Saturday. The signal needs to be clear as day and full bodied so we can do what we need to do to the audio. Apogee delivers on both fronts. And there is plenty of headroom on the Apogee products for when you want to really blast your mix! Also, the tiny USB MiC is unbelievably good. I use that all the time when I’m on the road when I need a great sounding vocal to demo. Tracks you hear on SNL have been recorded with this mic. 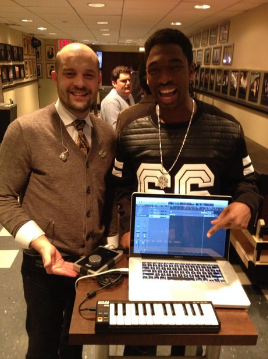 What’s your favorite SNL recording done with Apogee and why? I love them all, but I couldn’t have done the Buble Duets (Xmas episode 2011) or the Christmas Album (Fallon/JT episode) without the Duet. I had to be on set working out the tracks with the actors (establishing key/tempo/vibe) while they improvised (recording the audio) on set. I then went back to orchestrate and fill in the rest afterwards. This wouldn’t have been possible without a versatile, tight, quick setup. I also use the duet with the breakout box if I have to trigger samples from my rig on the floor of the studio. Given SNL’s hectic production schedule, you must be making last-minute changes to recordings all the time. Care to share any stories about working under intense deadlines? Everything is under intense deadlines, and I sometimes wish I could’ve done one or two more tweaks before a track airs, but that’s the way it goes. The pressure is actually addictive. I can’t stress enough how important the workflow is in this kind of environment. If you can’t figure it out in a couple minutes, find another path. And my Duet is my trusty machete through this jungle of last minute changes. Shows like the last one we did with Fallon and JT were INSANE. We had to make 30 or so tracks (with guitar overdubs)… I was literally making tweaks up until 11:15PM. Has your use of Apogee products changed the way you approach writing and recording music? I started composing on computers ten years ago. Things have become WAY more efficient. The computers are faster, the fidelity is higher, the gear is more robustly built, the mobility is key, and my workflow has to be so fast right now that it demands stable products which deliver the same result every time, anywhere. Apogee’s products have always given me the peace of mind to do what I have to do.